Eschewing the polarising perspectives that often characterise discussions of digital technologies in academia, The Digital Academic: Critical Perspectives on Digital Technologies in Higher Education, edited by Deborah Lupton, Inger Mewburn and Pat Thomson, offers an insightful and diverse take on the digital landscape in higher education, covering topics such as MOOCs, “flipped classrooms” and academic blogging. Keeping the human impact of these technologies firmly in view, the book’s contributions are lively, accessible and a frequent joy to read, recommends Jessica Frawley. The Digital Academic: Critical Perspectives on Digital Technologies in Higher Education. Deborah Lupton, Inger Mewburn and Pat Thomson (eds). Routledge. 2018. In 2016 a contributor to The Guardian’s “Academics Anonymous” section wrote a post entitled: “I’m a serious academic, not a professional Instagrammer“. In it, the anonymous author criticised and bemoaned the increasing expectation that academics should use social media, whether to promote themselves or to be seen to appear enthusiastic. Within a week of hitting the web, the article had garnered over 300 comments, 3,000 shares, one jocular counter piece and a small storm on Twitter whose apex took the form of a parody account replete with a meme of a cat wearing a lab coat (@SeriousAcademic). Amongst the outrage, cats and memes was a debate on what new technologies mean for academic work and the university. For universities, digital technologies bring major changes to the way that teaching, research and communication can occur. Blogs, tweets, automatically generated citation measures, learning analytics, Massive Open Online Courses (MOOCs), flipped classrooms, open access research – all of these impact on academic work and academic workers. In trying to make sense of this new world, discourse around digital technology in the academe can often result in polarising categories. On the one hand, we find the glorified hype of the Web 2.0. version of the university: the digital classrooms of the future where education is free and democratised for all. On the other, one-dimensional stereotypes of “digital natives” glued to iPhones and academics forced into yet more content production in the form of blogs, tweets and videos, all of which will be used to reward and penalise the neoliberal worker. Inadvertently, by assuming either utopic or dystopic futures, discussions of the digital are prone to mirroring the very binary structures of the machines and systems they seek to explore. In a context saturated with hype and hope, there is a need for more varied insight. The provision of this is one of the key achievements of The Digital Academic: Critical Perspectives on Digital Technologies in Higher Education. 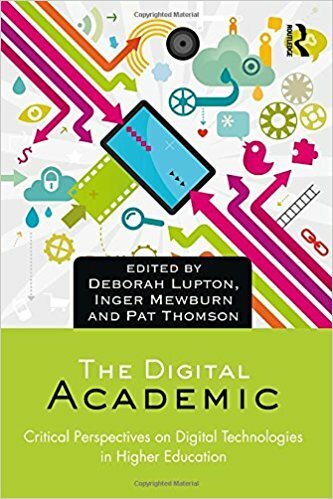 Edited by Deborah Lupton, Inger Mewburn (of Thesis Whisperer fame) and Pat Thomson, this scholarly edited work curates multiple critical perspectives from contributors, many of whom are themselves active digital users of social networking sites and digital technologies. This collaboration has resulted in a text whose academic prose remains lively, accessible and at times joyful to read. The inherent readability also attests to earlier commentary that blogging may serve to help academic writing. 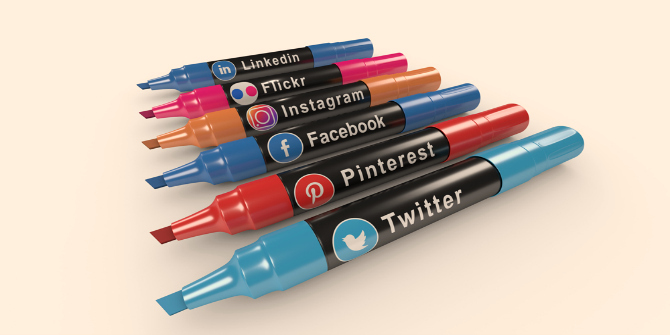 Image credit: Social Media Icons Marker by Animated Heaven. This work is licensed under a CC0 1.0 license. By focusing a critical lens on academic life, this collection contributes to an increasing body of research interested in universities and the realities for the academics who exist within them. If Burton Clark’s 1987 book The Academic Life began the conversation around the effects of changes such as massification and marketisation, then The Digital Academic takes this conversation in a specifically digital direction. While the digital landscape may be the context for this work, the focus remains a human one. Technical functionality and specifications give way to more socio-technical philosophies. This shows in methods that consistently explore the digital by turning towards the human, with interviews, surveys and ethnographies taking the place of more quantitative tech-centric approaches. This decision to focus on the voice of the academic is moreover an important one, particularly at a time when the academic self is so frequently quantified, measured and commodified. Instead of presenting technology as something all-determining, each chapter invites the reader to explore how new technologies are actually used within faculties and institutions. By taking a critical perspective, the authors deliberately situate this usage within the various power structures that exist within and across the contemporary academe. These chapters navigate away from visions of the utopic or dystopic university of the future to explore what is happening in the here and now, in what Neil Selwyn (2014) has referred to as the messy and mundane everyday realities of university life. One of the main vehicles for thinking about this is the academic self. As observed by the editors, “an academic in a cloister is a very different creature from one on a stage” (6). Though blogs, Twitter and Facebook are performative spaces, academic use and appropriation of these stages are diverse. Chapter Two’s study of PhD students found blogging to be a way for students to create a scholarly identity, think out loud, receive feedback and engage with a community. Likewise, Charlotte Frost’s chapter on her work around PhD2Published demonstrates a way of publicly self-teaching and how this manifest as part of her own career trajectory – countering claims that no-one ever gets tenure from a blog post. As a set of critical perspectives, this book would not be complete without a deep dive into power structures and hidden labour. In Chapters Eight and Nine, the respective authors’ turn their attention to academic experiences of two oft-endorsed innovations: “flipped classrooms” and MOOCs. Though an abundance of research already exists on these, most has so far focused on their implications for learning and teaching. Instead, these chapters contribute insight from a wider academic perspective. Martin Forsey and Sara Page’s chapter on flipped classrooms demonstrates that, while “flipping” lecture content to online delivery to allow for more interactive classes can be very positive, students and staff have to invest considerable time and energy to make them work. Likewise, Katharina Freud et al’s chapter on MOOCs draws attention to the “labour iceberg” of MOOC delivery and the way the MOOC marketplace may lead to some voices, content and forms of knowledge being privileged over others. These perspectives draw further attention to the complexities of work within the neoliberal university context. Taken together, the overall direction of The Digital Academic is to encourage further critical exploration of the role that digital media plays for the academy. Aside from this shared goal, the book’s chapters eschew taking one united position or advancing a single argument. Instead, illumination comes from different voices. In edited scholarly works this approach can run the risk of lacking coherence, however well justified or theorised by the editorial team. Yet, in this instance, the approach is not only appropriate but well-executed. Though there can always be a case made for further diversity, there remains value in the specifics of the qualitative even, or especially because, it is always partial, never universal and seldom fully representative. For the academe “there is no escaping the digital – no outside to which we can retreat” (15). As such, this volume is a vital contribution for anyone who cares about academic work and labour. While a number of the theoretically denser chapters will elude some, as a collection The Digital Academic offers a sufficient range to engage a wide variety of readers. This is important since one of the barriers to broader uptake of research of this nature has been its impermeability to academics working outside the arts and social sciences. Those who are curious will find Chapter One to be an accessible and highly enjoyable overview of the key issues, while interview transcripts in Chapters Eleven and Twelve embrace a conversational messiness that provides an alternative to the research studies. In summary, this thoughtful volume invites us to go beneath the surface of hypes and hopes to critically explore the wonders and problems of the digital university. This invitation is one that anyone who cares about the modern university should most definitely accept. Dr Jessica Frawley is a Lecturer in Academic Development and an Honorary Associate of the Sydney School of Architecture, Design and Planning at the University of Sydney. Having a cross-disciplinary background, with degrees in both information technology and the humanities, Jessica’s research and teaching focus on understanding and designing technologies from a human perspective. Jessica currently teaches undergraduate subjects in design and postgraduate subjects in higher education and educational technologies. Dr Frawley is Co-President of the Australian and New Zealand Mobile Learning Group, Fellow of the Higher Education Academy and a regular contributor and managing editor for Teaching@Sydney.